Most students over pack and under budget. You won’t need as much clothing as you think you do and you will definitely need more money. I have never heard a student say, “I budgeted too much, I have so much money.” It is almost always the reverse. Or at least attempt to — “hello,” “thank you,” and “please” go along way in any language and country. Traveling requires a lot of walking and luggage hauling. You will enjoy the experience more and your feet will hurt a lot less if you aren’t completely out of shape. You don’t need to train for a marathon, but putting in the effort to hit the gym or walk more before departure will go a long way. Make the most of your time abroad by traveling on the weekends. If you’re in Europe you can basically see a new country every weekend. If you’re in Florence, I highly recommend traveling with my friends at Florence For Fun. As someone who gets car sick, I was not excited about the idea of a 10-hour bus ride to Budapest. But I bought some motion sickness pills and settled in with a pillow and a blanket and it wasn’t terrible. It is one of the cheapest ways to travel and once I arrived in Budapest, it quickly became worth it. This is important especially if you’re planning on traveling. It may be mild in Florence in the fall, but you might want to ski one weekend in Switzerland or lay on the beach in Santorini. Be adventurous in all things — what you eat, where you travel, and what you do! Some of my most amazing experiences were when I put my fear aside and just went for it. This might seem like a non brainer, but when you’re busy traveling and tap water is not free like it is back home, you often forget. Make an effort to drink lots of water, even if it’s more expensive than you think it should be. 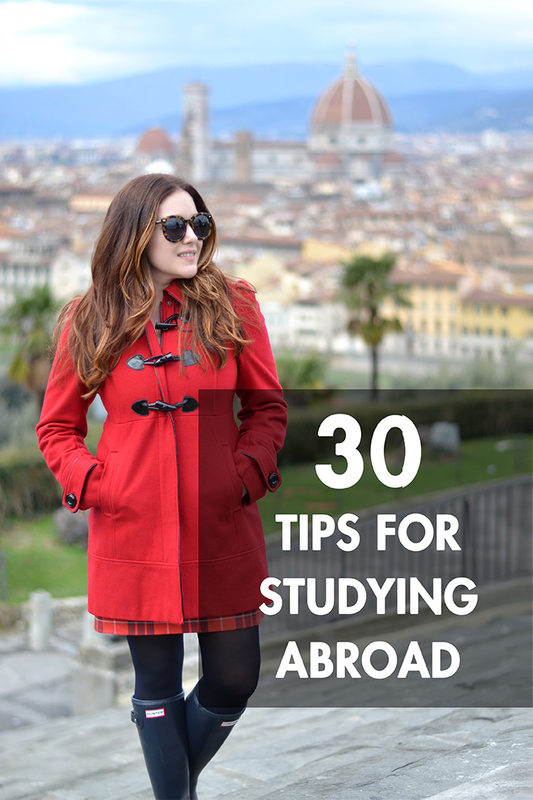 Don’t go into a semester abroad expecting to have lots of time to relax or that you will come home well rested. It is a once in a lifetime experience, which means it is completely worth all of the early mornings, late nights, and long travel days. I think I have bookmarked/pinned half your blog in the past few weeks… it has been a lifesaver when preparing to study abroad! Thanks for another helpful post! I will be studying abroad this year and was thinking about starting a blog of my adventures. I was wondering if you had some tips/ where the best place to start would be. I started with blogger. It is free and easy to use. You can download affordable templates from places like creative market.com to give it some style. You will definitely want to bring a quality camera and make the effort to take good pictures. These pictures and your blog will be your best souvenir!